Welcome to the Rose Cross Community in Portland, Oregon! We are part of the Apostolic Johannite Church, and is served by Rev. 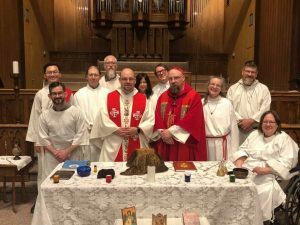 Deacon Jason Campbell as rector. As a principle, we affirm the presence of Divinity in all Beings. We therefore welcome and affirm people of every gender, race, ethnicity, economic and social status, gender identity, and sexual orientation. What is the Apostolic Johannite Church? We are an esoteric, Gnostic, Christian community embracing the beauty and mystery of the living Christian tradition and sacramental life. We also delight in the freedoms to choose how we understand our tradition and to explore other paths that are among the particular gifts of our modern world.. If you’re interested in pursuing your personal spiritual journey in community with others, perhaps you’re one of us. Read more about Johannite spirituality here. To learn more about our tradition, visit our parent website here. We encourage you to consider visiting us and even getting involved.